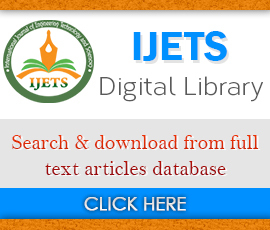 The International Journal on Engineering Technology and Science (IJETS) is a peer reviewed international online journal for scientists and engineers involved in all aspects of Engineering and technology to publish high quality, refereed papers. The journal offers survey and review articles from experts in the field, promoting insight and understanding of the state of the art, and trends in technology. The contents include original research and innovative applications from all parts of the world. While the journal presents mostly previously unpublished materials, selected conference papers with exceptional merit are also published, at the discretion of the editors of IJETS.